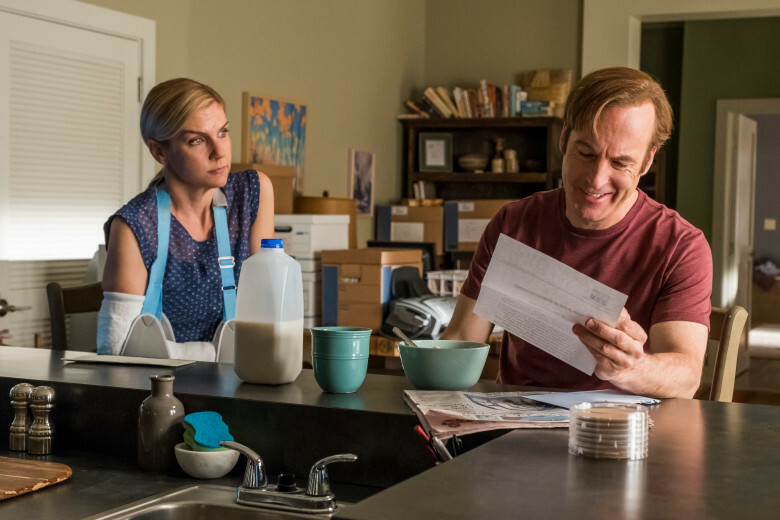 I’m not going to say that the Breaking Bad/Better Call Saul universe has the best version of character development in the history of television, but I will say that I’ve always appreciated that when something important happens, the characters are never quite the same afterwards. Walter White was never the same after he let Jane die (to say nothing of Jesse Pinkman). Skyler never recovered after learning just what it was that Walt did for a living (to say nothing of Hank). So it is with Jimmy McGill after the death of his brother. Watching him squirm and fidget whenever anyone mentions his dear, departed Chuck and knowing that it’s inching him closer and closer to rejecting his family name outright is interesting, but since we know that destination already, the real intrigue comes from what this will do to poor Kim. So in that sense, this episode belongs more to her. Alongside her new paralegal Viola (Keiko Agena), she’s trying her hardest to keep up with her clients at Mesa Verde. The scene where Kevin and Paige show off their new expansion plans and Kim not so subtly starts having a panic attack hurt me to see, especially when you consider that it didn’t start in earnest until Kevin mentioned a new branch in her home of Nebraska. We still don’t entirely know the circumstances of what drove Kim to the desert wastes of New Mexico, and I don’t believe her when she told Rich Schweikart that it was just restlessness. Anyway, Kim’s story in this episode closes in the final scene, when she finally gives Jimmy his inheritance and the mysterious letter Chuck wrote for his eyes only. Her heartbreak at Jimmy’s seeming non-reaction to the contents of the (very old) letter are telling. The letter itself is fluff, written well before Jimmy had ever become a lawyer and the elder McGill could still pretend to be proud of him, and in that sense, I understand why it didn’t effect Jimmy. And yet, when looked at in concert with how Jimmy has been acting since he found out he was indirectly involved with pushing Chuck over that final hill, it’s definitely…cold, at least. If nothing else, Jimmy McGill is a man defined by his passions. This new version is someone new, someone different. Someone other than the man Kim fell in love with. Of course, we know that Jimmy has more interesting things on his mind. After being categorically shot down by Mike in his efforts to pull off the Hummel heist of the century, Jimmy turns to everyone’s favorite black market criminal veterinarian, Dr. Caldera (Joe DeRosa), who puts him in contact with a petty thief named Ira (Franc Ross), who is actually a returning Breaking Bad character. Eagle-eyed viewers might remember him as the man who sold Vamonos Pest to Mike and Walt in Season 5. He seems to be another member of Jimmy/Saul’s ever expanding rolodex of miscellaneous criminals. Anyway, he takes the job, and everything goes great until it turns out Mr. Neff himself is actually living in his office, living through a 1950s sitcom plot of buying his wife a vacuum cleaner a present. Ira manages to avoid being seen, but is stuck in the office, needing Jimmy to come pull a Slippin Jimmy and distract the mark by breaking into his car. It’s a great, low key heist sequence, one that someone as professional as Mike Ehrmantraut would never find himself in, and as Jimmy and Ira make their great escape, you’d be forgiven for confusing the way the whole thing is shot for a flashback to Jimmy and Marco pulling tricks in Chicago. Slippin’ Jimmy is back, again acting as our hero’s coping mechanism when trauma overwhelms his personal life. In the other half of the show (which nearly intersects when Jimmy almost runs headlong into The Cousins at Dr. Caldera’s office) deals with another con job. Namely, Gus Fring and his shadow organization trying to cover for the death of Arturo and neatly install their new operative: Nacho. Using what I assume is Arturo’s car, Tyrus and Victor stage his death to look like a hit, firing a bunch of bullets into his car (and one into his head), blowing out his tires and then firing a couple into Nacho for good measure. While any medical examiner would obviously be able to tell that Arturo was dead long before he was shot, the genius of it is how the Cartel would obviously never be using proper channels for something like this. If it works, Nacho’s cover is secure. If it doesn’t, Nacho is dead. No loose ends for the Chicken Man. So Arturo’s body is burned by the Cousins after they come across the scene, barely saving Nacho and forcing them to use Dr. Caldera to treat his injuries (the good doctor tells Nacho he no longer wants to be involved in Cartel business, but the look Leonel gives him tells me that Cartel business isn’t quite done with him yet). 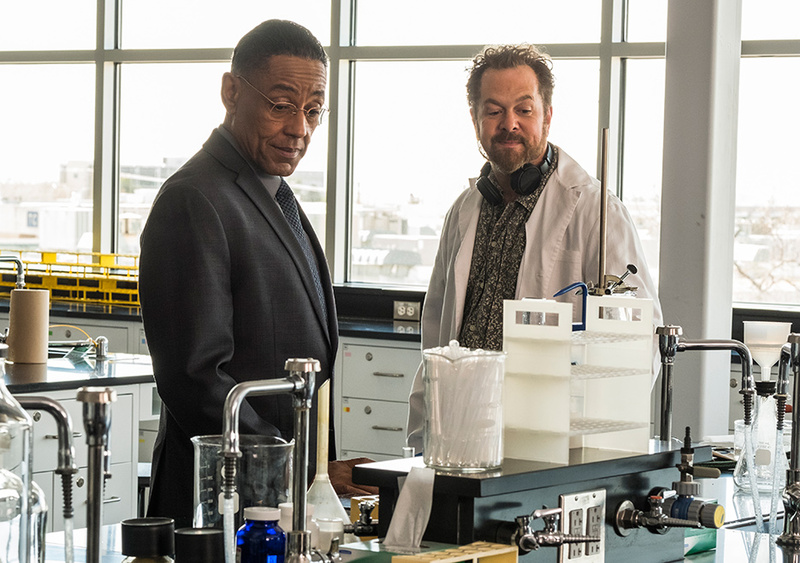 So that all leads us to the scene most Breaking Bad fans have been waiting patiently for ever since we heard Gus Fring would be making his return: the first time he visits good old Gale Boetticher (the always fantastic David Costabile). Under orders from Juan Bolsa to halt shipments across the border until they can find out who hit Nacho and Arturo, Gus is told to find his own source of product for the time being. Of course, he already had Gale in mind, and the way he subtly manipulates the poor man into making him free meth is both sad and brutal. I said last week that the Jimmy McGill we know would be a lot more of a match for Gus than the Saul Goodman we know from the original show, but as cold and ruthless he tries to be, he’s nothing compared to the sociopathic death machine that is Gustavo Fring. I love that Mike’s only scene is that first one. He sees how stupid and petty Jimmy’s plan is, and he just peaces out to go listen to baseball or whatever. I also love that Jimmy only stands to make around $4000 from the Hummel heist, while his pittance from Chuck’s estate is $5000, an amount he treats with open disdain. The amount of money doesn’t matter to him, it’s where it came from, which is a key distinction in separating his fall from Walter White’s. Some really grody effects work on Nacho’s surgery scene. I especially liked how chapped and nasty his lips looked after what I imagine was several hours bleeding out in the desert. Just some great pathetic guy acting by Andrew Freidman. With original recipe Walt, Gale and now Mr Neff, these shows are showcases for sad middle-aged white men. I was going to say that Gus’s organization is almost too efficient to even need Mike’s services, but then I thought of what he’d make of Arturo’s staged death. Surely he’d notice that the bullet casings were dropped in a very particular pattern and that there weren’t any bullet holes on Nacho’s side of the car. Again, please give me that Detective Mike miniseries where he becomes the Sherlock Holmes of northern New Mexico.